I just love cooking hot comfort foods in the fall and winter. Some of my favorite cold weather recipes are chili, chicken soup, and beef stew. When the aroma of a hot pot of soup simmering on the stove top fills my home it reminds me of warm family gatherings from my childhood. Cooking a delicious meal for my family gives me a sense of gratification knowing I am blessed with a nice home and hot food on the table. I am looking forward to serving soup, chowder, minestrone and other heavenly cold weather recipes this winter. 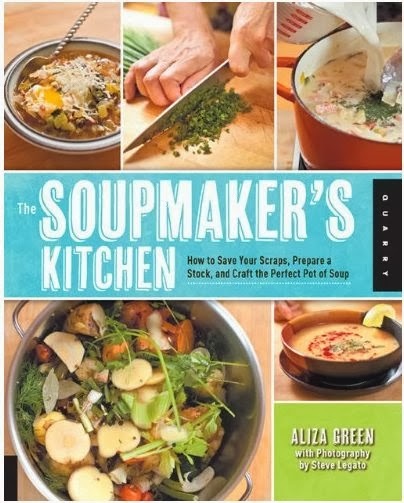 “The Soupmaker’s Kitchen: How to Save Your Scraps, Prepare a Stock, and Craft the Perfect Pot of Soup ” by Aliza Green is a complete guide to making soup using scraps and your own stock. This book shows you how to save money, reduce kitchen waste, and use fresh ingredients to make the perfect pot of soup. She even includes a chapter on chilled summer soups. Although, I prefer to serve soup in the fall and winter. The book and recipes are very simple to follow and each one has colorful photos which help explain every step. You can purchase “The Soupmaker’s Kitchen, How to Save Your Scraps, Prepare a Stock, and Craft the Perfect Pot of Soup,” on amazon.com or at your local bookstore. Aliza Green is an award-winning author, journalist, and influential chef whose books include “The Butcher’s Apprentice”, “Making Artisan Pasta”, “The Fishmonger’s Apprentice”, and “The Soupmaker’s Kitchen.” A former food columnist for the Philadelphia Inquirer and Cooking Light, Green is known for her excyclopedic knowledge of every possible ingredient, its history, culture, and use in the kitchen and bakery. Green’s thirteen books have garnered high praise from critics, readers, and culinary professionals alike, including a James Beard award for “Best single-Subject Cookbook” in 2001 for “Ceviche! : Seafood, Salads, and Cocktails with a Latino Twist,” (Running Press, 2001), which she co-authored with Chef Guillermo Pernot. She lives near Philadelphia, PA where she makes a big pot of soup at least once a week and there’s always a pot of stock on the stove. Visit her online at alizagreen.com. *Disclosure: I received a copy of “The Soupmaker’s Kitchen How to Save Your Scraps, Prepare a Stock, and Craft the Perfect Pot of Soup,” in exchange for this review. All opinions are accurate and 100% mine.